Maccaferri’s Geosynthetic systems are economically viable and multifunctional alternatives to alternative drainage solutions such as gravel or aggregate layers. 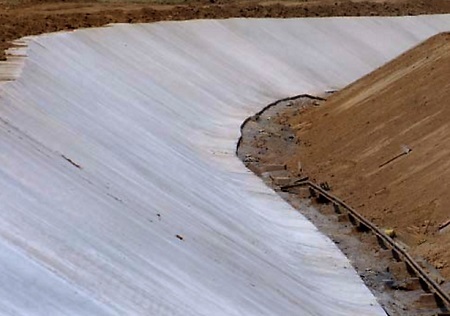 The world of Geosynthetics provides Maccaferri with the ideal solution for the drainage system and infrastructural queries. Geosynthetics are used widely in the field of civil engineering for many years. Maccaferri has specialized itself in Geosynthetic solutions that work to help solve infrastructural issues, independent of geographic, climatic or technological differences. Geosynthetics provide clients with an array of advantages mainly because they offer multi-functional performance while remaining economically viable. There is, in fact, no other construction material available in the entire construction industry that can provide such an abundant variety of sound solutions to development queries in the field of civil engineering. In India, preceding or alternative solutions to Geosynthetics, such as gravel or aggregate layers combined with sand, no longer provide clients with a viable solution to their needs as the aggregates used for filtering and drainage layers have become a commodity. This unexpected circumstance might be considered as positive seeing as it has created a space for new ideas and customized solutions revolving around the use of Geosynthetics. Maccaferri’s drainage composites (geocomposite) are a particular type of geosynthetics that enable rapid drainage of excess water while preventing soil particle migration (filtration). For more specific technical information, please download the Technical Paper. Drainage composites are now used for a significant amount of projects including the Canal Lining Project in Haryana, India. For this project, the Haryana Irrigation Department was looking for a product that could replace the conventional granular gravel layer and allow for the installation of a network of perforated pipe designed for insertion underneath the concrete lining system that was planned to line a selected part of the canal. Maccaferri proposed the MacDrain N–105 M Draining Composite to the client as it reduces pore water pressures significantly thus eliminating the risk posed by saturated ground conditions. Furthermore, MacDrain is straightforward and fast to install, and it cuts the cost of conventional drainage systems. The solution was accepted by the Haryana Irrigation Department and was successfully installed into the canal project. Both Maccaferri and the Client were satisfied with the outcome of the installation. For more information, please download our project-specific case history. For further information on our works, please contact us.